The old Oswego school on State Street. This was torn down to build the new school. (By the old Methodist Church) From John Bickner's (Edith Bickner Brown) Oct. 1964. Joe Wells was janitor (George Willet's grandfather) about 1918. Description Scanned as B & W; cardboard mat. Same as 380a, b, c, d, & 1571, 1620, & 1621. (may be cropped differently.) On building: Public School erected 1893. Transcription The old Oswego school on State Street. 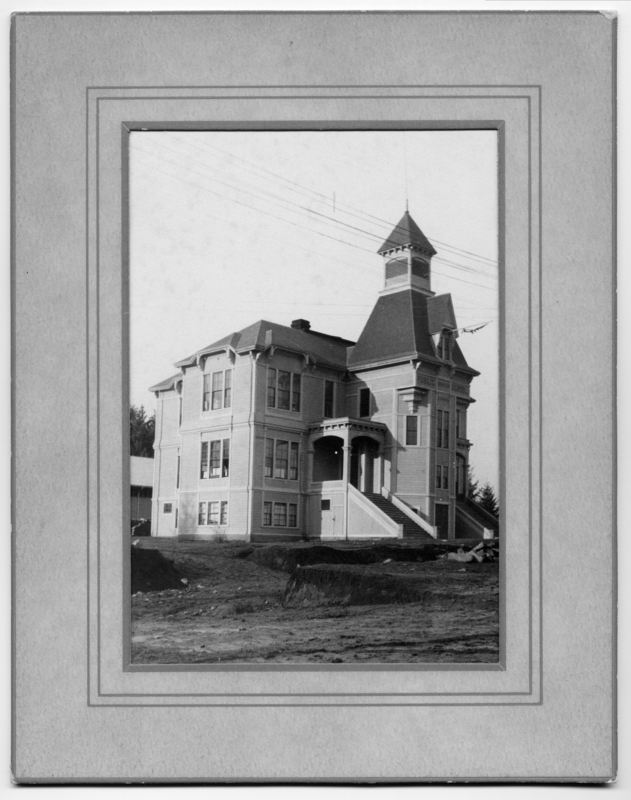 This was torn down to build the new school. (By the old Methodist Church) From John Bickner's (Edith Bickner Brown) Oct. 1964. Joe Wells was janitor (George Willet's grandfather) about 1918. Physical Description H 9" x L 7.5"